A charming butterfly sleeve top with embroidered purse decorates this adorable two-piece toddler clothing set from Baby Togs. 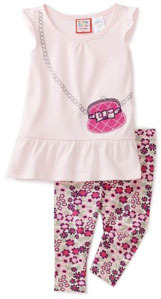 This set features an elastic waistband on the flowered capri leggings, and an embroidered purse on the top. Baby Togs 58% cotton/42% polyester; legging: 97% cotton/3% spandex Machine Wash Fits toddler girls size 2T, 3T and 4T.